One of my favorite meals is breakfast. I could eat breakfast for every meal of the day. These protein pancakes are high in protein and carbs and are great for a pre or post workout meal. You can put different toppings and to change the macro nutrients. 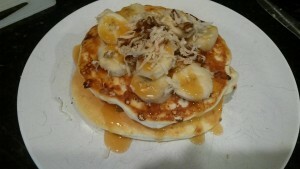 My personal favorite is caramel syrup, bananas and pecans. Heat pan and spray with coconut oil. If using a 12 in pan pour entire batter in pan. If using a smaller pan then pour 1/2 of the batter in the pan. Wait until the edges look dry so when you flipped the pancake it doesn’t fall apart. Cook second side for 2-3 minutes. Once done top with fresh fruit or other toppings. Note: You can use this batter for pancakes or waffles.